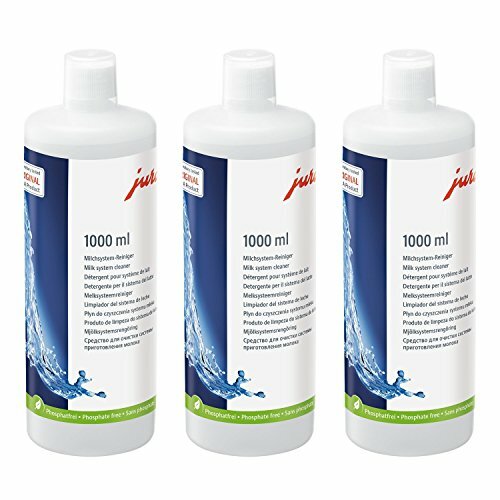 Keep your milk frothing equipment in top shape with this set of three bottles of Jura Auto Cappuccino Concentrate cleaner. When you froth and steam, little milk droplets will stay inside the frother, requiring thorough cleaning. This detergent removes the need for taking apart your frothers, as you can simply throw all the parts that come in contact with milk into a cup with six ounces of water and a half ounce of the special concentrate. All milk fat will be removed in less than 10 minutes, keeping your parts fresh and working. Best of all, this concentrate works with all frothing systems.